The tri-tip cut comes from the bottom sirloin area of the loin primal. Slightly curved and shaped like a triangle (hence the name), the muscle weighs between a pound and a half to 2 and a half pounds. Cheap, full of flavor and yet tender, the tri-tip is a lean cut with little marbling. 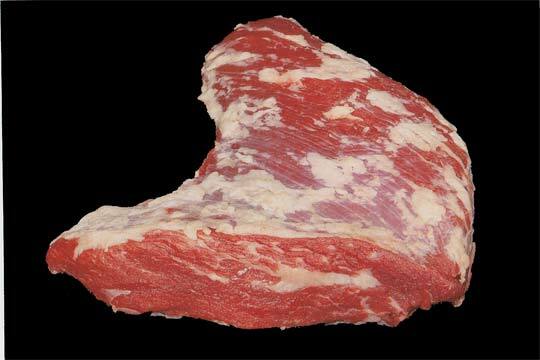 For a long time, butchers and meat packers would grind the tri-tip into hamburger meat, or cut it into stew meat. Eventually, someone in Santa Maria, California, decided to try something different. After applying a rub, they put the tri-tip on a rotisserie and cooked until it was medium rare. The finished product was so well received that Santa Maria steaks are still sold to this day, and the majority of tri-tip cuts are shipped to California. In New York, tri-tip found acceptance at the Florence Meat Market, where it was cut into inch thick slices and sold as "Newport steaks". 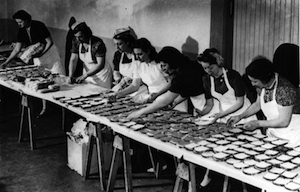 The name came from the Newport cigarette quarter moon logo that the steaks resemble. 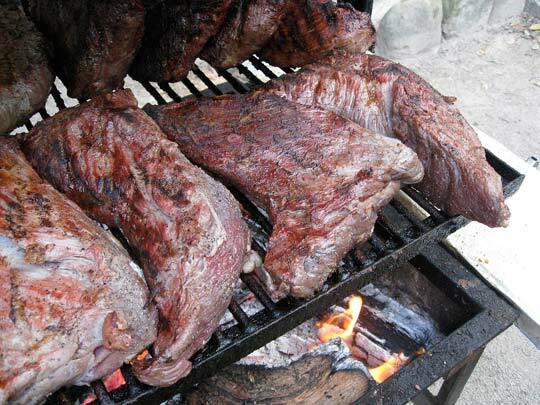 Recently, tri-tip has become popular within competitive chili cooking. The leanness of the meat keeps the chili from becoming greasy, which can lead to deducted points from the judges. 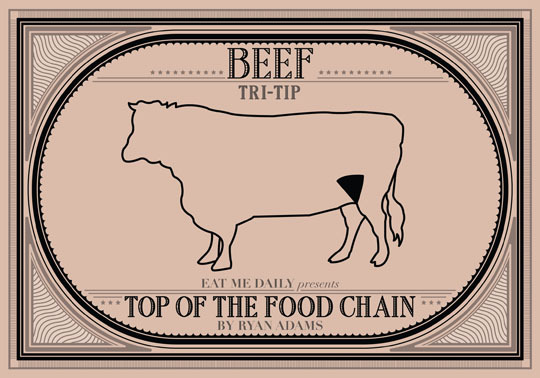 There are two tri-tips per carcass, and they can be sold whole, or cut into steaks. Sometimes butchers will call the tri-tip "coulotte", but that term should be reserved for the top sirloin cap. If you're in California, congratulations! 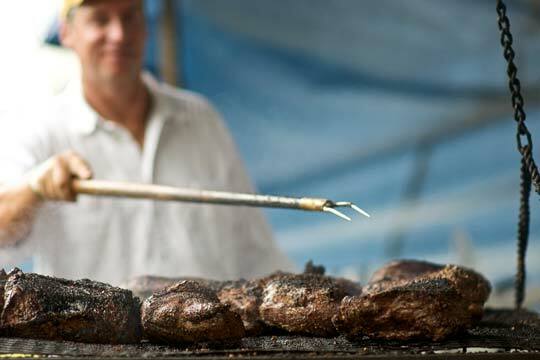 Tri-tip is well-known in your area, and it's likely that your supermarket won't grind them up. It's not impossible for folks elsewhere to source this cut. Your local supermarket will be able to order them for you with little issue, and dedicated butcher shops will have them on hand, but call ahead to make sure. Plan on having six to twelve ounces per serving. The meat itself should be bright cherry-red with a small amount of fat running through the meat. Check that the muscle is firm to the touch, and that the container doesn't contain excess liquid. Whole Tri-tip can be stored in the refrigerator for tree days before cooking, and one day if you've got a tri-tip steak. Beef can be frozen in its original packaging for up to two weeks. If you're going for longer storage, you'll want to prevent freezer burn by re-wrapping the meat in freezer paper, plastic freezer bags or heavy-duty aluminum foil. Try to remove as much air from the packaging as possible before sealing. Roasted whole, tri-tip makes for some seriously good eats. The meat should be cooked over high heat quickly, and served rare to medium rare to ensure that the meat is moist and tender. Grilling and broiling are excellent methods of preparation as well. If you'd like, marinating is popular with this kind of cut, as the process imparts extra flavor and moisture while softening the meat. This recipe comes from Derrick Riches. Lightly oil the cooking grate on your grill. Preheat grill and prepare for indirect grilling. Combine garlic powder, onion powder, pepper and salt. Rub it over the surface of the tri-tip roast. Place tri-tip on grill, fat side up. You can place a drip pan under it to catch the drips which will make a great gravy later. With the grill on low cook for about 1 hours or until it reaches your desires doneness. Let it rest for 5 minutes before cutting to allow the juices to redistribute themselves throughout the muscle tissue. I grew up in Santa Maria -- it's awesome seeing Tri-Tip get love from other places around the country. Even more awesome seeing it with an actually authentic recipe, so THANK you! It's the party food par excellence on the Central Coast of California: always grilled over red oak with a simple seasoning of salt, pepper, and maybe garlic and onion, then served with garlic bread, salsa, and pinquito beans. What happened to you Eat Me Daily? Where have you and your fun and interesting posts gone? Anybody got suggestions on the best place to get an EMD type fix now that these silences keep happening? http://eater.com/ The new home for two former EMD editors. http://grubstreet.com/ Stomping grounds for yet another EMD editor. That's where I'm going now. thanks - i miss my daily fix. It was my comment, wasn't it? I'm sorry! Baby, please don't be mad! Thanks for the suggestions. I'll come back if you ever get it together, EMD. See ya! This meaty post was fantastic and enlightening and also tantalising. I'm now salivating! It's been over two years. I think it's dead, Jim.